What the heck is muesli? The term “muesli” (pronounced “MEWS-lee,” as in rhymes with “loosely”) is derived from the Swiss-German word “mus” — meaning, appropriately enough, “mixture.” The mixture consists of rolled oats, nuts, seeds, fresh or dried fruit and other whole grains, like rye or barley. Admittedly, this makes muesli sound an awful lot like granola. Although both foods can be good sources of whole grains, fiber, fatty acids and protein, granola is often toasted in oil and sweetened with honey or a syrup, making it much higher in fat and sugar. Muesli, alternatively, consists of raw ingredients either eaten like cereal, with milk, yogurt or even fruit juice added right before serving, or it can be soaked ahead of time. Soaking muesli creates a texture similar to chilled oatmeal, making it an attractive breakfast option during the dog days of summer. Of course, muesli also can be heated, if desired. Muesli Fusion, a cereal manufacturer, suggests cooking a half cup of muesli with a half cup of water or milk over medium heat until boiling, stirring frequently. Alternatively, microwave equal parts muesli and water or milk on high for two minutes, stopping every 30 seconds to stir. Cold, hot, raw, soaked — muesli is a choose-your-own-adventure type of cereal. According to The Kitchn, soaking muesli also might provide greater nutritional benefits because a substance called phytic acid in unsoaked grains’ outer layer joins forces with such nutrients as calcium in your body to hinder absorption. You wouldn’t want all your healthy-eating hard work to go down the drain, would you? Personally, as muesli lacks the enjoyable crunch of traditional granola, I prefer the texture of soaked muesli — even adding the milk half an hour before breakfast makes the cereal much more palatable. The oats and grains drink up the milk, becoming tender and soft, while the dried fruit rehydrates and plumps up. Yum! The invention of this nutritious breakfast is credited to the Swiss physician Maximilian Bircher-Benner in the early 20th century, developed as a means to help alleviate and prevent disease in his patients. The original recipe allegedly consisted of oats, raw apples, condensed milk and lemon juice. Eventually muesli was mass-produced, which led to the addition of dried fruits, a very concentrated source of sugar. Some packaged varieties of muesli boast of their 50% fruit content, luring unsuspecting dieters into consuming more sugar over breakfast than they would in a chocolate bar. Alternatively, making your own muesli and adding fresh berries or fruit is a good way to get plenty of dietary fiber without the sugar high. One cup, or 85 g, of muesli provides 6.2 g of dietary fiber, according to the USDA Nutrient Database. The Academy of Nutrition and Dietetics recommends adults consume 25 g to 38 g of fiber each day. 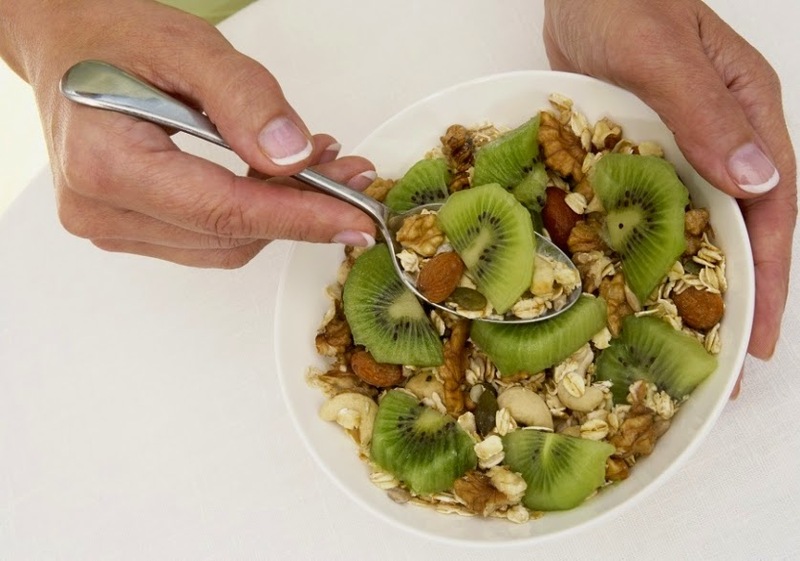 Although muesli is not a low-calorie food — a half-cup contains anywhere from 144 to 250 calories, depending on the brand and ingredients, and that does include the added calories from milk, yogurt or juice — the fiber and protein content of muesli creates a feeling of fullness to keep you going until lunchtime. The USDA reports that a half-cup of muesli contains 4 g of protein, providing 9% of women’s and 7% of men’s recommended dietary allowance. According to the Harvard School of Public Health, high-protein foods move more slowly from the stomach to the intestine, and the body uses more calories to digest protein than it does to digest fats or carbs. So, while muesli is not a light breakfast, per say, it can help end your mid-morning snack habit. My favorite store-bought muesli is the German-made, all-natural Seitenbacher Muesli #2 (Berries Temptation), which contains no trans-fat, cholesterol, sugar or artificial colors and preservatives. Although fairly calorie-conscious, with 160 calories in a 2/3-cup serving, the inclusion of dried apples, dried raspberries and raisins does boost the sugar content to 11 g per serving — and I like to add fresh peach or banana slices to bulk it up a bit, meaning, well, more sugar. Those wanting to tame their sweet tooth and make their own nutrient-dense muesli in bulk can check out this gluten-free and vegan recipe from the food and nutrition blog Nutrition Stripped. This muesli version includes lots of good-tasting, good-for-you ingredients, like quinoa flakes, pumpkin seeds, unsweetened coconut flakes, goji berries and ground cinnamon. Making muesli is pretty fool-proof, as you can throw in your favorite nuts and fruits into the mix and almost certainly create a tasting, satisfying breakfast. You’ll never go back to boring old oatmeal again.